Loose Gravel Press, 9780615392189, 404pp. The follow-up novel to the blockbuster Sideways tracks the continuing story of Miles Raymond and his buddy Jack. It's seven years later. Miles has written a novel that has been made into a wildly successful movie, and the movie has changed his life. Jack, contrarily, is divorced, has a kid, and is on the skids. Phyllis, Miles's mom, has suffered a stroke that's left her wheelchair-bound and wasting away in assisted-living. She desperately wants to live with her sister in Wisconsin. When Miles gets invited to be master of ceremonies at a Pinot Noir festival in Oregon, he hatches a harebrained road trip. With Jack as his co-pilot, he leases a handicapped-equipped rampvan, hires a pot-smoking Filipina caretaker and, with his mother's rascally Yorkie in tow, they take off for Wisconsin via Oregon's fabled Willamette Valley, where Miles is Master of ceremonies of the International Pinot Festival. It is a road novel for the smart set and wine lover, and anything but predictable. 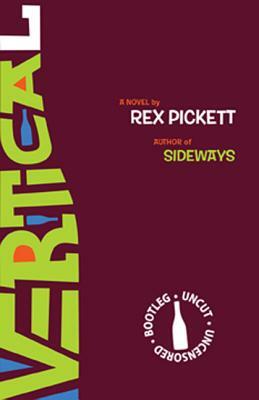 Rex Pickett is a screenwriter and novelist living in Santa Monica, CA. His novel Sideways was made into the movie of the same title, directed and co-adapted by Election and About Schmidt filmmaker Alexander Payne. Sideways garnered over 350 prestigious awards from various critics and awards organizations, including, most notably, the Academy Award for Best Adapted Screenplay. It recently was voted as one of 101 Greatest Screenplays of All Time by the Writers Guild of America. Rex's script My Mother Dreams the Satan's Disciples in New York was the basis for the Barbara Schock-directed AFI film which won the 2000 Oscar for Best Live Action Short. He is currently writing a comedy series for HBO entitled The Nose. Vertical is his second novel.